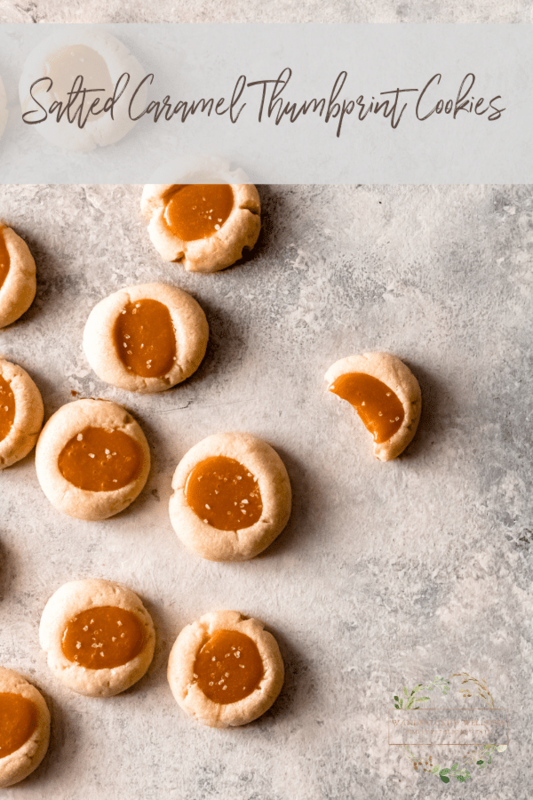 Brighten up your holiday cookie tray with these delicious and buttery salted caramel thumbprint cookies! 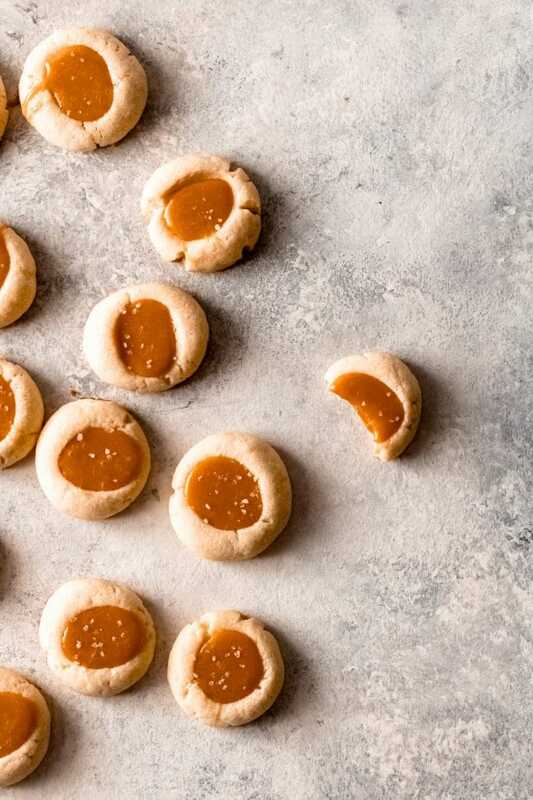 It’s officially holiday cookie season right now, which means it’s time to add these salted caramel thumbprint cookies to your lineup! Thumbprint cookies actually originate back to a common Swedish cookie known as Hallongrotta, which means “raspberry cave” in Swedish. Traditional thumbprint cookies are filled with jam, however, as recipes have evolved they’ve become one of the most versatile cookies. What I love about thumbprint cookies is that they’re buttery and delicious, super easy to make, and you can literally fill them with just about anything, from jam to curd to caramel! I may have been slightly addicted to these after making them and they may or may not have lasted very long. Oops! How long do thumbprint cookies last? Do you participate in a holiday cookie exchange, or maybe gift fresh homebaked goods as gifts? 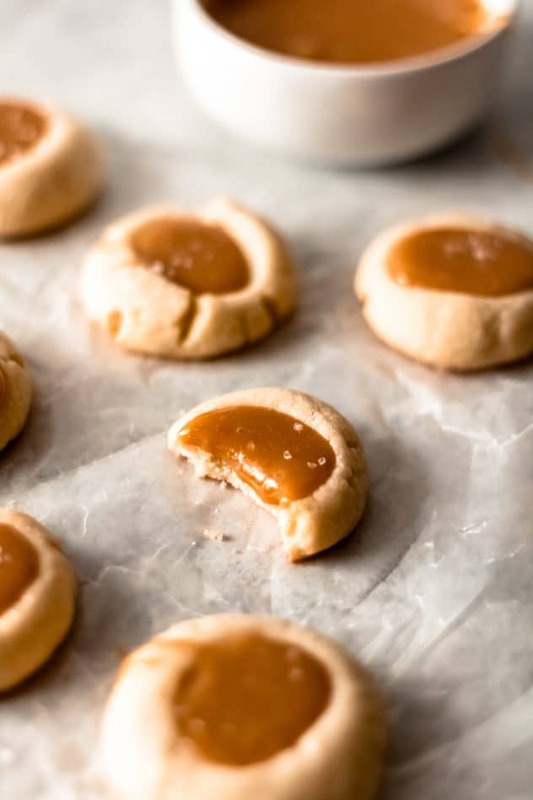 If so, these salted caramel thumbprint cookies would be a great addition to your holiday baking. Freshly baked thumbprint cookies can be stored in an airtight container at room temperature for about two to three weeks, so gifting these simple yet elegant cookies is a great option. Look at that bite! The caramel thickens up so that you don’t have a gooey mess with each bite, yet it’s not so thick that they’re hard to chew. And, in keeping with simple yet elegant, I decided to keep the caramel creation process simple by using soft caramel candies combined with a little heavy cream. This gives you a nice creamy caramel sauce that thickens up well for thumbprint cookies. I’m telling you, buttery. perfection. 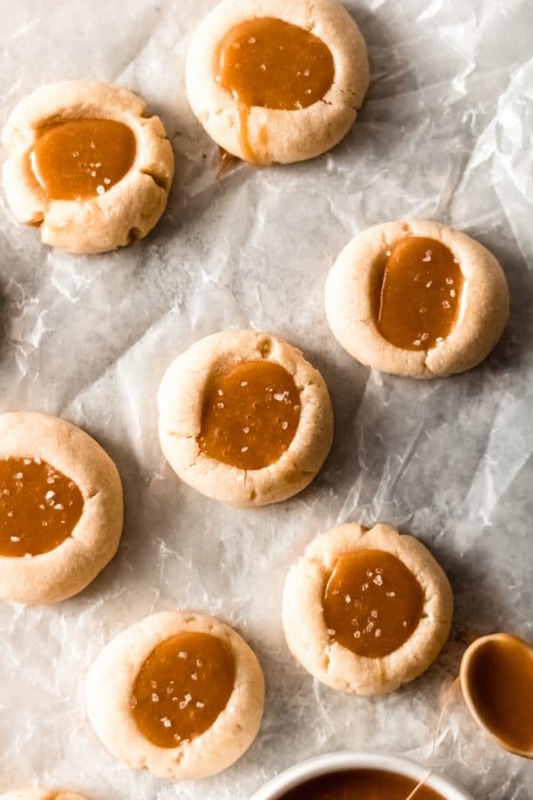 should be the name of these salted caramel thumbprint cookies. 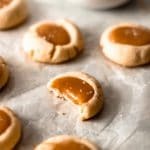 Brighten your holiday platter with these delicious and buttery salted caramel thumbprint cookies. Soft buttery cookies filled with rich caramel and topped with a hint of sea salt. Soften 1 cup of the unsalted butter at room temperature in your stand mixer bowl. Once softened, beat the butter and 2/3 cup granulated sugar on medium-high speed until light and fluffy. Continue beating and add in the egg yolks and vanilla. Once combined, add in the flour and salt and reduce speed to medium and continue mixing until the dough thickens and is well-combined. Using your hands, form the dough into 1-inch balls and place onto a lined baking sheet. Using your thumb, press down into the center of the ball creating a small indention in the dough. Bake for 8 minutes, then open the oven and using the back side of a teaspoon, press down on the indention once again. Back for an additional 3-4 minutes. Once finished baking, remove from oven and transfer to a cooling rack. For the caramel sauce, add the caramels and the heavy cream to a saucepan and melt over medium-low heat, stirring frequently. Continue stirring until the caramel is completely melted and smooth. Using a teaspoon, fill each cookie with 1 teaspoon of caramel. Sprinkle with coarse sea salt.